WaterHealth's UV treatment plants deliver drinkable water to thousands who don't have it. SAN FRANCISCO (Business 2.0 Magazine) -- The background: More than a billion people lack access to drinkable water. Theirs is teeming with bacteria and viruses or polluted with raw sewage. The result: Nearly 5,000 children die each day from waterborne diseases such as diarrhea, cholera, and typhoid. The economic impact is also staggering: $170 billion in losses from water-related illnesses. The solution: WaterHealth International, based in Lake Forest, Calif., sells miniature water-treatment plants to rural communities in the developing world, where potable water is financially or logistically out of reach. When WaterHealth enters a community, it first locates a source - a nearby river or well - and builds a delivery system to get the water to its garage-size WaterHealth Centre. Clean machine. Addy's UV device has been installed in 500 WaterHealth centers, including one in India's Andhra Pradesh state. Water is piped through four mechanical filters and a carbon filter, then through a 15-pound ultraviolet disinfection device that removes all but .01 percent of bacteria and viruses. Ashok Gadgil, WaterHealth's VP for scientific affairs, began developing the system after a cholera outbreak killed 2,200 people in his native India. The system has no moving parts, and the UV lamp needs just 60 watts of power, which can be supplied by a car battery. Installation costs a 6,000-person village about $10 per person. WaterHealth works with local banks and nonprofits to help finance the systems. It also trains and pays villagers to operate and maintain the water centers, which cost each resident about $2 a year. That revenue is initially split between WaterHealth and the community, which can use the money to purchase the systems outright. "We become part of those villages," says WaterHealth CEO Tralance Addy. "We have as much interest in maintaining the systems as they do." "The safe-water issue is related closely to costs," says Jim Plonka, vice president of Dow Venture Capital, which recently led a $7 million round of funding for WaterHealth. "WaterHealth has a proven technology package and a viable business model." The payoff: WaterHealth operates more than 500 systems in Asia, Africa, and Central America, delivering water to an estimated 500,000 people. The privately held company won't disclose its revenue, but its typical installation brings in as much as $50,000. 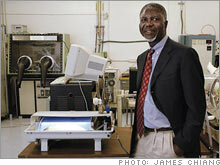 WaterHealth expects to turn a profit next year with plans to install new systems in West Africa and India. The opportunity: WaterHealth estimates that there are about 2 billion people without access to clean water or whose water supplies could be improved with filtering. "We want to play a leadership role in delivering clean water," Addy says, "but the market opportunity is certainly large enough to accommodate a number of players."